Affordable Hotel with Rustic Mountain Cabins, Perfect for Nature Lovers. 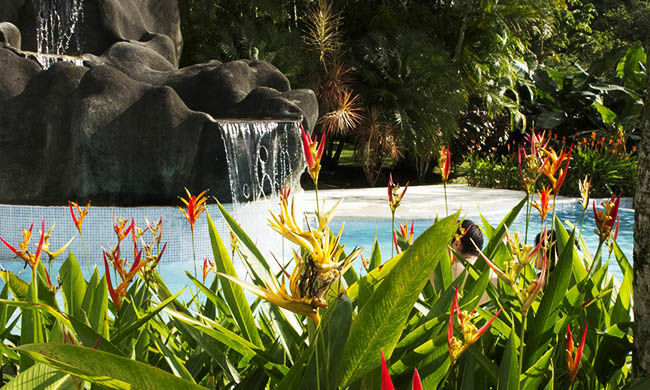 Lomas del Volcán Hotel is located along the foothills of Arenal Volcano in the province of Alajuela. The hotel’s rustic mountain cabins are perfect for nature lovers, couples, and families with older children looking for value and relaxation. The hotel has 47 cabin-style bungalows with rustic wooden furnishing and basic amenities. Each free-standing bungalow comes with cable TV, A/C, safe deposit box, minibar, coffeemaker, and patio with views of the Arenal Volcano. Hair dryers are available by request at the lobby. Hotel amenities include complimentary WiFi throughout the property and in-room massage treatments by appointment. The Lomas Restaurant offers a buffet breakfast and a la carte lunch and dinner menus. They serve a delicious variety of Costa Rican and international dishes using quality local ingredients. El Volcan Bar also serves many local favorites, like their Tico-style “Moonshine Mojito” as well as the old faithfuls, like piña coladas made with fresh pineapple from the region. Lomas del Volcán includes continental breakfast in their nightly rate. Other on-site amenities include a swimming pool, Jacuzzi, and 1.5 miles of nature trails.